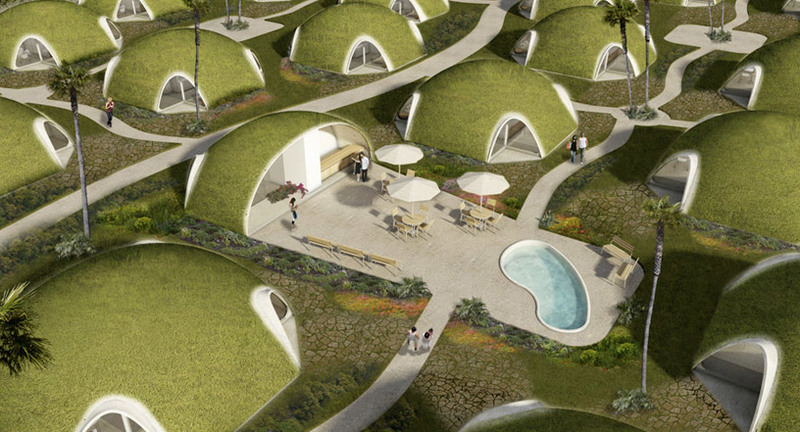 This may look like Frodo Baggins' hobbit 'hood, but it's actually a network of modular, green-roofed structures called Binishells. However, as modern as they may appear, this idea isn't new. Originally conceived by renowned architect Dante Bini in the 1960s, Binishells were recently relaunched with the help of Bini's son Nicoló. The new system, which uses low air pressure to lift and shape a collection of thin reinforced concrete structures, is an array of incredibly efficient abodes that use 80% less materials, have 95% of the embodied CO2, and boast a carbon footprint 80% smaller than traditional constructions. The basic idea behind these dome-like structures is to substitute formwork and heavy machinery with air. Instead of big cranes, low air pressure is used to lift and shape wet concrete on top of reinforced steel. Since Binishells can be formed into an infinite variety of shapes, they can be used to build anything from schools, to offices, to low-cost housing, to emergency shelters and everything in between. While they may sound fragile since they’re relatively lightweight shells (hence their name), they’re actually quite strong and able to resist hurricanes, flooding, earthquakes and fires. They’re suited for temporary relief housing because they’re easily deployable and can even be fabricated from local materials. Another cool thing about Binishells is that they’re visually appealing, especially when they’re linked together to form larger communities or structures. 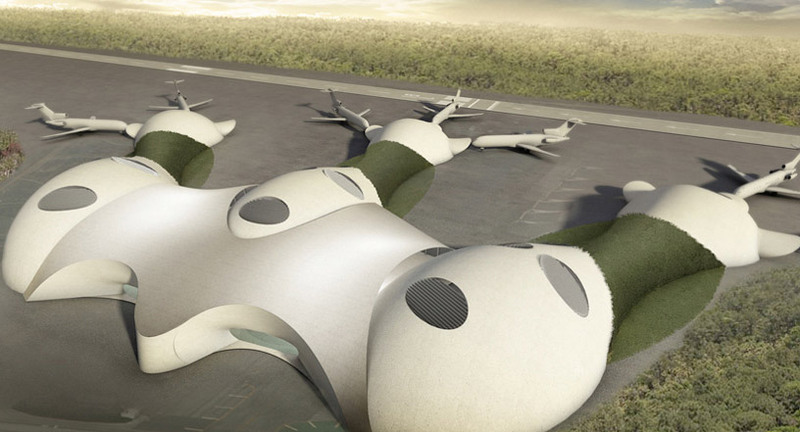 The result can be contemporary (as shown in the rendering of an airport above) or idyllic (like the green village seen in the opening image). Like other modular building units, the shells can painted, covered in grass or customized to suit the needs of the end user making it adaptable to almost any type of use. awesome!~ where can i find construction specs? The basic idea behind these dome-like structures is to substitute formwork and heavy machinery with air. Instead of big cranes, low air pressure is used to lift and shape wet concrete on top of reinforced steel. Since Binishells can be formed into an infinite variety of shapes, they can be used to build anything from schools, to offices, to low-cost housing to emergency shelters and everything in between. While they may sound fragile since they're relatively lightweight shells (hence their name), they're actually quite strong and able to resist hurricanes, flooding, earthquakes and fires. Binishells are suited for temporary relief housing because they're easily deployable and can even be fabricated from local materials. Another cool thing about Binishells is that they're visually appealing, especially when they're linked together to form larger communities or structures. ..or idyllic, like this green villa. Like other modular building units, the shells can painted, covered in grass or customized to suit the needs of the end user making it adaptable to almost any type of use.